The years 950-1200 are often called the Golden Age of the Jews in Spain. During this period, the Jews reached a peak of achievement in all aspects of their life—political, spiritual, and cultural. They produced great works of literature and philosophy; their poetry represents a peak of literary achievement unparalleled in Hebrew until the twentieth century. The poets of the Golden Age forged the language of the Hebrew Bible into a magnificent instrument for the expression of every facet of their experience--love and friendship, war and exile, philosophy and prayer. Their poems reflect their overarching consciousness of Israel’s relationship with God and their deep concern with the fate of the Jewish people in exile. Not until modern times did Hebrew poetic genius flourish again with such freedom and with such intensity. This volume conveys in modern English something of the greatness of that literature while as far as possible preserving the poetic values and beauty of the Hebrew original. Brief notes on the work of each of the thirteen poets represented put the poems in their proper perspective and do much to elucidate their meaning. The poets included are Dunash Halevi ben Labrat, Joseph ibn Abithur, Isaac ibn Kalpon, Samuel Hanagid, Solomon ibn Gabirol, Isaac ibn Gi’at, Moses ibn Ezra, Judah Halevi, Abraham ibn Ezra, Joseph ibn Zabara, Judah Alharizi, Shem Tob ben Palquera, and Todros ben Judah Abulafia. 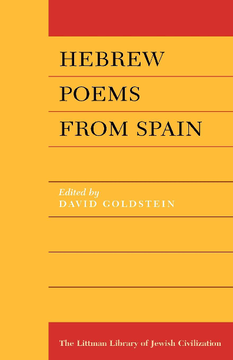 David Goldstein, late Curator of Hebrew Books and Manuscripts at the British Library, was awarded the Webber Prize 1987 for this translation shortly before he died. How is it You have not Given this Thought?